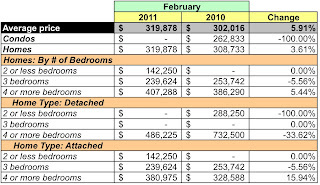 In this post I look at contracts closed in February in zip code 20011 using data released by MRIS. The zip code is roughly bordered by Eastern Ave NE on the east, Rock Creek Park on the west, Piney Branch Parkway NW / Quincy St NW / Rock Creek Church Rd NW on the south, and Tuckerman St NW on the north. The 16th Street Heights, Brightwood, Crestwood, Manor Park, and Petworth neighborhoods are in this zip code. Compared to the same month in 2010, aggregate dollar volume was down by almost 20%. The number of units sold fell, too, down 24.39%. The average sales price increased 5.91% and the median sales price was 6.57% higher. 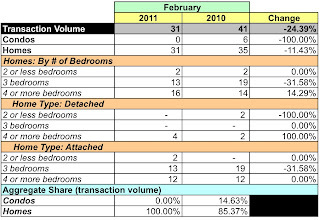 No condos were sold in February; all 31 sales were homes. I can't recall any time in 5 years I've been analyzing real estate sales in the District that I've seen a month where no condos sold in a zip code. The average price for a home was 3.61% higher than the same month in 2010. Dollar volume for homes was down 8.23%. One 4 bedroom home that sold for $800-999K was the highest priced sale in 20011 in February. I suspect that the February 2011 average price for a home in 20011 would have fallen 4.75-6.84% when compared to February 2010 if this sale were excluded from the analysis. In February, zip code 20011 represented 5.78% of the District's dollar volume and 8.4% of unit sales. The zip code's average and median prices were lower than the District as a whole, 31.25% and 18.89% lower, respectively. In the aggregate, at February's sales rate there's a 3.85 months supply for houses listed in 20011; there were 85 active listings for condos in February. However, when I look more closely at the market by price segment, $300K appears to be the dividing line between seller's and buyer's markets. Below $300K, the inventory is tight, under a 4 months supply for homes; above $300K, it's more than 6 months. 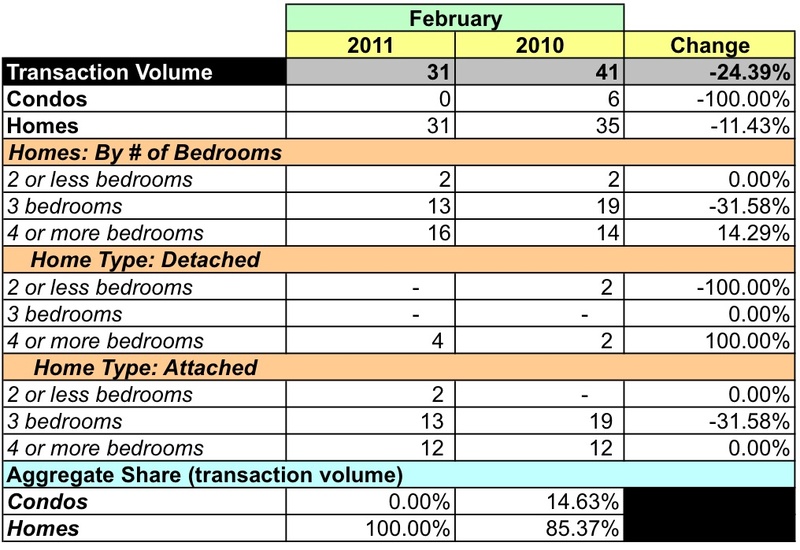 In terms of overall sales activity, the market in 20011 during February 2011 is slightly weaker than February 2010 (note, however, that more homes went under contract in February 2011 than 2010). But with that exception, February 2011 was stronger than any February since 2007, inclusive. It's difficult to draw conclusions about a zip code that had a mere 31 contracts close in February and more so given the limited scope of the data, e.g., MRIS does not provide data by neighborhood. Those who are trying to sell need to keep in mind that at this time $300K appears to be the tipping point between seller's and buyer's markets. Likewise, those who would like to partake in the renovation of properties in 20011's neighborhoods should keep $300K in mind, too.